Dignitaries, including Director General Kim Hyun-hwan in charge of tourism policy at the Ministry of Culture, Sports and Tourism (MCST), Secretary General Han Kyung-ah of the Visit Korea Committee, and Vice Chairman Suh Young-gil of the Korea Tourism Association, attend a ceremony to open the Korea Grand Sale 2019 at the Cheonggaecheon Plaza in downtown Seoul on Jan. 17. 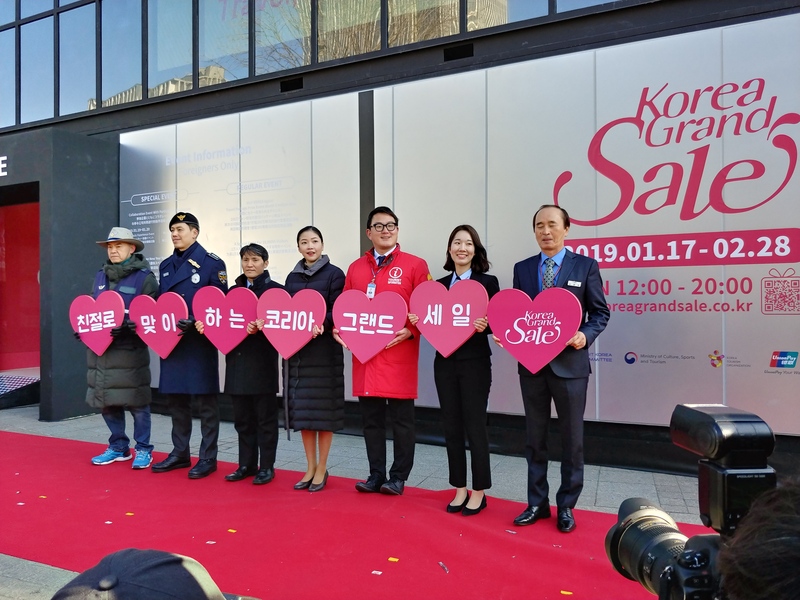 A ceremony to open the Korea Grand Sale 2019 takes place at the Welcome Center of the Cheonggaecheon Plaza on Jan. 17. The Ministry of Culture, Sports and Tourism (MCST) and the Visit Korea Committee are jointly holding the Korea Grand Sale 2019, which runs from Jan. 17 until Feb. 28. The Korea Grand Sale has become one of Korea’s representative shopping festivals, held since 2011 with the goal of spurring foreign tourists’ visits to Korea and boosting tourism revenues with Korean businesses’ voluntary participation. The Korea Grand Sale 2019, tailored to three themes - travel, taste and touch - boasts diverse programs designed to offer deep discounts, offer inbound travelers’ wider choice of destinations, create a convenient travel environment, and improve foreign tourists’ satisfaction. 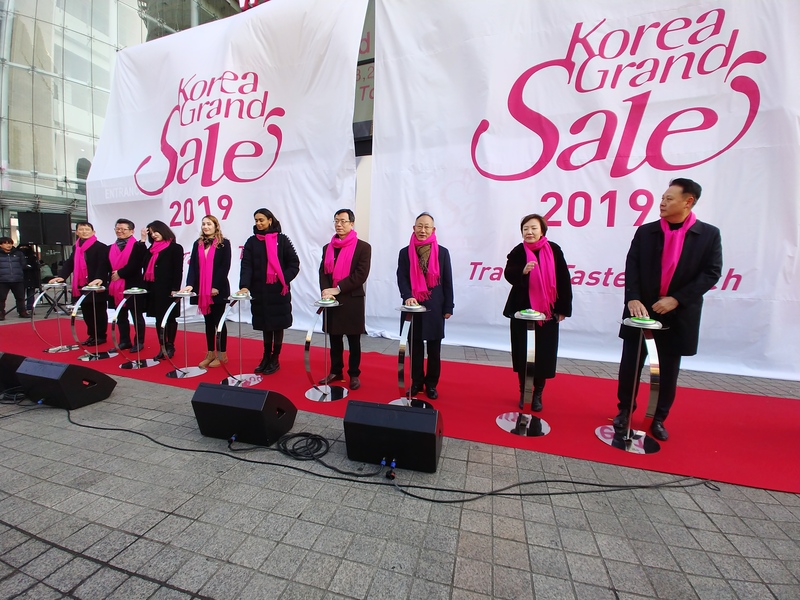 During the Korea Grand Sale 2019, more than 850 businesses give a wide range of discounts to foreign tourists. As of Jan. 7, 855 companies were offering discounts, and they included 15 transportation companies, 475 food & beverage outlets, 217 accommodation establishments, and 47 shopping outlets, and 67 experience spots. Air Seoul and Jeju Air are giving a discount of up to 97 percent and 85 percent on flights bound for Korea, respectively. A combined eight airliners are participating in the air ticket discounts. Bus travel products that take travels from Seoul to provincial areas will benefit from discounts, including a buy-one-get-one-free on all K-travel bus routes. About 70 food & beverage outlets in deluxe hotels, including those of Grand InterContinental, are offering a discount of up to 25 percent. Ramada Haeundae offers a discount of 55 percent to 75 percent discount on rooms. Preferential treatment is offered to foreigners at tourist spots, shopping, performance and other sectors. Director General Kim Hyun-hwan of the MCST and Secretary General Han Kyung-ah of the Visit Korea Committee hold a session to explain the Korea Grand Sale 2019 following an opening ceremony. A survey showed that 72.5 percent of foreigners who traveled to Korea in 2017 turned out to primarily enjoy shopping while 58.2 percent were found to mostly enjoy eating. The Korea Grand Sale 2019 is an opportunity for foreign tourists to taste Korea’s finest foods. The “Nopo” travel program will be offered in which renowned Korean chef Park Chan-il introduces storylines of the unknown, more than 50 years hot restaurants, including Cheongjinok, Uraeok, and Hadonggwan, and guides tours. 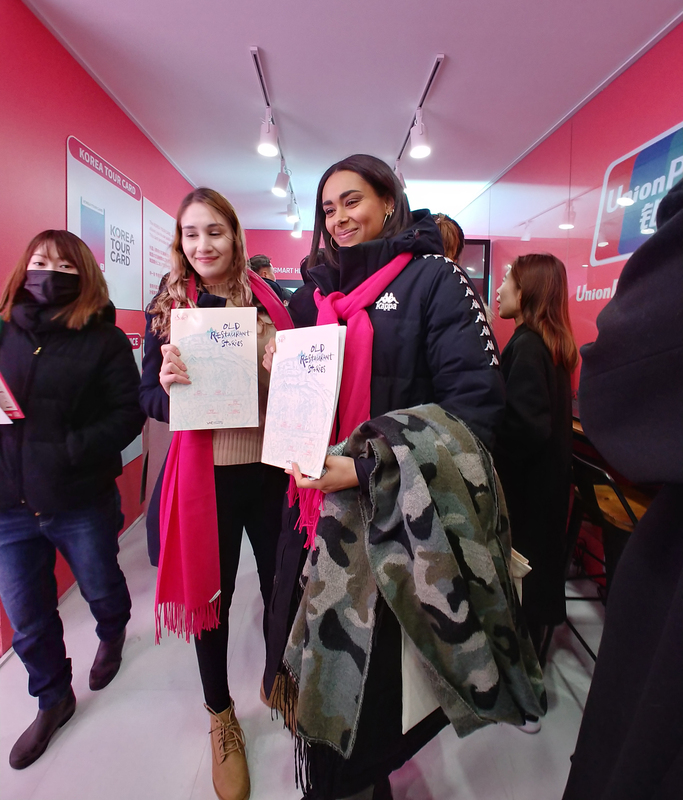 The Grand Sale 2019 also offers diverse tour and experience products, such as Korean food and temple food cooking classes like “I Love Hansik” and Korea Temple Food & Culture Experience Center, a package of ski products with discounts, designed to help foreigners enjoy an exciting winter of Korea, and the provision of travel products to Korea via global travel platforms. The Welcome Center of the Seoul Cheonggaecheon Plaza installed in front of exit No. 5 of Gwanghwamun Subway Station will be operated from noon until 8 p.m. daily during the promotion period. Shuttle buses to hot tourist spots for foreigners such as East Gate and Hongik University are operated. Welcoming booths will be installed at Incheon and Gimpo airports from Feb. 1 to Feb. 8 in celebration of the Korean Lunar New Year and Chinese New Year. Convenient services such as tour guides in English, Chinese and Japanese are offered at Korea’s representative gateways and major downtown tourist spots to minimize inconveniences foreign tourists might experience during their stay. Korea Tour Cards with 200-member companies across the nation will be offered to 50 foreigners on a first-come, first-served basis daily at the Welcome Center of the Cheonggaecheon Plaza. In particular, a 10,000th foreign traveler to visit Korea will be offered with a free hotel room coupon, while winners of a lottery of purchase receipt holders will be entitled to a free package of travel products to Korea, other special bountiful events will take place to add to exciting joy and entice inbound travelers’ revisiting. Now that explanation sessions at exhibitions in Korea and abroad and on- and off-line publicity activities have been conducted since last September, the official said, the Korea Grand Sale 2019 is hoped to be a successful win-win festival for not only inbound travels and the Korean tourism industry. An opening ceremony of the Korea Grand Sale 2019 will take place at the Welcome Center of the Cheonggaecheon Plaza at 11:30 on Jan. 17. In which events such as congratulatory performance will take place.